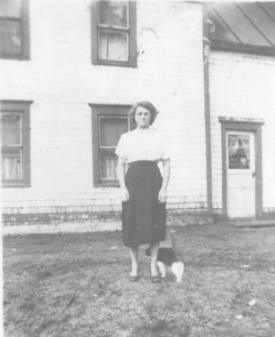 This is a photograph of my maternal grandmother Eveline Melvine Luce standing in front of the home she shared with her husband Adelard Lagace in Bathurst, New Brunswick. 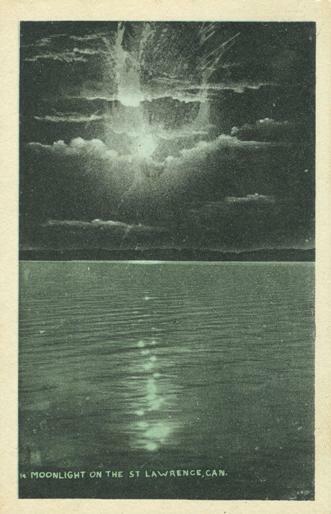 I believe the photo dates from the late 1940s. There’s a notation on the back from my mother Golda Lagace where she says that ”This is the home where I was born“. I got my earliest start in serious genealogy from a distant relative whom I’ve never met and who may never even have known I exist. That man was Ruben J. Leger and he was the brother of my paternal grandmother Yvonne Leger (Gen.9). Ruben Leger never knew it in his lifetime, but some papers he’d sent to my father gave my first glimpse into how to build a family tree. In former posts I discussed my grandfather Rosaire Theriault‘s difficult childhood as he grew up in a very large family, tried to evade the World War I draft, and then faced the Great Depression of the 1920s. After marrying my grandmother Yvonne Leger (Gen.9) , Rosaire tried to support his growing family through various legal and illegal means. Finally, in 1924 he decided – after much urging and insistence from my grandmother – that they would try their luck in Schenectady, N.Y. When I heard that the latest topic for the Canadian Carnival of Genealogy was Black Sheep Canadian Ancestors – I was sure I’d have to sit this one out. Almost all of my ancestors have been hard-working farmers with gigantic families and very little free time for getting into mischief. Note: While completing a Bachelor of Arts degree at McGill University in the 1940s, my father E.A. Theriault (Gen.11) interviewed his parents Rosaire Theriault (Gen.10) and his mother Yvonne Leger (Gen. 9). Portions of the manuscript are sensitive so for the moment they are published in little snippets! Ever since I was a teenager in the ’60s but especially after I had travelled far from home in the ’70s and ’80s, I’ve always been fascinated by history and curious about my own family’s origins. I knew that my mother and father’s families had been French-speaking Catholics from New Brunswick and that they’d migrated to Quebec in the 1940s, but I had a lot of questions. How did they get to New Brunswick in the first place? How long had we been in Canada? And what was I to make of the stories of an “Indian Princess” in our maternal line?